I begin this second installment by presenting some of the evidence indicating that providers who treat a disproportionate share of the poor and the sick suffer from fewer resources, and that P4P and VBP (hereafter just VBP) worsen resource disparities. I will then argue that this outcome is the direct result of a habit, now deeply ingrained among health policy experts and managed care advocates, of calling resource-related problems “quality” problems. I will describe instances of this behavior that occurred early in the history of the “quality” crusade that began in 1999 with the publication of To Err is Human by the Institute of Medicine (IOM). I closed my last article noting that CMS’s Hospital Readmission Reduction Program (HRRP) may be killing up to 5,000 seniors with congestive heart failure (CHF) every year. Under the HRRP, CMS tracks readmissions for CHF, heart attack, pneumonia and a few other diagnoses. Readmission rates above the national average for patients with these diagnoses are punished by reductions in all Medicare payments to the “bad” hospitals. The savings from the penalties inflicted on the “bad” hospitals are redistributed to the “good” hospitals. this terrible outcome is caused by CMS’s inability to adjust readmission rates and other “quality” measures, as well as cost measures, to reflect accurately factors outside clinic and hospital control, the most important of which are the health status and incomes of their patients, and the resources available to the clinics and hospitals. The result of these and other VBP programs (ACOs, “medical homes,” MACRA, and possibly bundled payments) is that hospitals and clinics serving the nation’s poorest and sickest people are being drained of vital resources. The November 2017 edition of Medical Care contains a paper demonstrating that two Medicare VBP programs, the HRRP and the Hospital Value-Based Purchasing (HVBP) program, both implemented in 2013, have hammered hospitals in poorer communities. The authors noted at the beginning of the paper, “Previous studies showed that the … HRRP and the … HVBP disproportionately penalized hospitals caring for the poor.” They stated their goal was to determine how this difference in penalties affected the financial performance of poor hospitals compared with better-off hospitals. 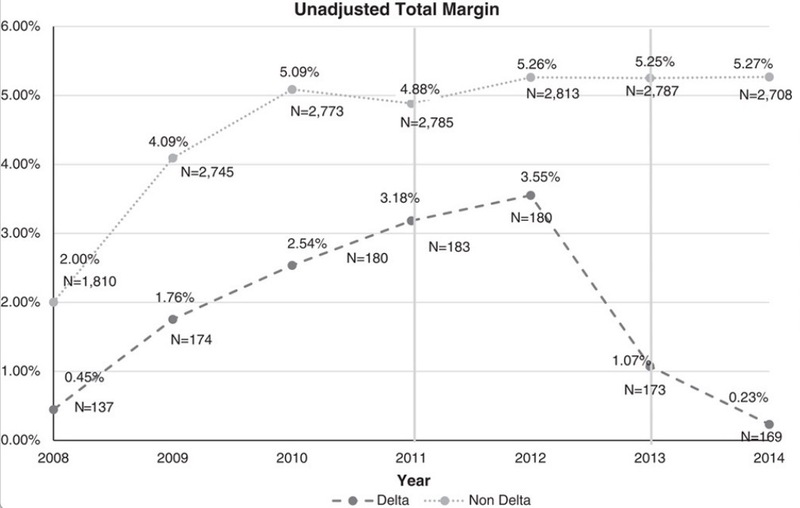 The authors found that Delta hospitals started and ended the study period (2008-2013) with fewer resources than the non-Delta hospitals – they served more Medicare and Medicaid patients, and had lower operating and total margins over the entire study period. Figures 1 and 2 show the changes in operating and total margins for the two groups of hospitals. The authors concluded: “Policy makers should modify these two programs to ensure that resources are not moved from the communities that need them most.” “Modifying” these programs is not the solution. They should be terminated, and more resources should be funneled into to the Delta hospitals and others serving a disproportionate share of the sick and the poor. The IOM report provided a blueprint for reducing medical errors, naming four key factors that contribute to the epidemic of errors. First, fragmentation and decentralization of the health care system may create unsafe conditions for patients and impede patient safety efforts. Second, licensing and accreditation processes give insufficient attention to preventing errors. Third the medical liability system, which discourages physicians from admitting mistakes, impedes systematic efforts to uncover and learn from errors. Fourth, third-party purchasers of health care offer little incentive for health care organizations and providers to improve safety and quality. Not one word about whether insufficient resources, or misallocation of resources, might contribute to some of those “preventable deaths.” Not surprisingly, given this one-eyed diagnosis of the problem, the IOM did not recommend more resources or better distribution of resources (for example, more spending on nurses and less spending on administrative costs generated by managed care schemes). Instead, they called for “transformation” of our “delivery system” via greater consolidation of our already highly concentrated system, more pay-for-performance schemes, installation of electronic medical records across the country to facilitate the implementation of P4P, and studies of alternatives to malpractice suits. Many studies have documented a correlation between insufficient resources and negative health outcomes. An inverse correlation between nurse-to-patient ratios and adverse events in hospitals, for example, is well established (see Aiken et al. and a review of the literature by the Agency for Healthcare Research and Quality ). Just as our commonsense tells us a high school football team will lose to a professional football team, so it tells us that inequitable resource distribution will profoundly affect performance by health care institutions and professionals. What possible excuse did the IOM have for ignoring the resource issue in To Err Is Human and their 2001 sequel, Crossing the Quality Chasm? If I could rewrite those books, their titles would be Conflating Quality with Insufficient Resources is To Err Big Time, and Crossing the Resource Chasm. The IOM is to the managed care movement what St. Paul was to Christians: An indisputable authority on the religion. (I have no idea what the IOM did to warrant that status, but they unquestionably have it among the faithful.) The IOM’s willingness to deny the role that insufficient resources plays in “preventable” adverse outcomes in hospitals has deeply influenced the faithful ever since. An influential paper published by Elizabeth McGlynn and colleagues at RAND four years after the publication of To Err reinforced the principle, first clearly established by the IOM, that blindness to resource disparities is acceptable, perhaps even admirable. You might think this paper, having documented so much underuse, would have been seen by managed care advocates as a repudiation of the assumption most fundamental to their creed – that US health care costs are high because the fee-for-service system induces overuse. Nope. Instead managed care buffs seized on the paper’s underuse data as proof that “quality” is bad and doctors are to blame. The title of the paper, “The quality of health care delivered to adults in the United States,” and the authors’ interpretation of their findings (they recommended closer supervision of doctors) bear some of the blame. Today the deceptive practice of measuring the consequences of resource disparities but not the resource disparities themselves, and blaming the consequences on doctors and hospitals, is at epidemic levels. This practice generates above-average blame and financial punishment for minority providers and the hospitals and clinics that serve a high-proportion of minority patients. This deceptive practice in turn leads to another deceptive practice: Recommending better “quality” measures to catch all those bad doctors, especially the black and brown doctors. And ‘round and ‘round the cycle goes. A paper by Andreea Creeanga et al. illustrates both practices – blaming high-minority providers for problems caused in whole or in part by insufficient resources, and declaring that the solution is more measurement, not a better allocation of resources. Creeanga et al. sought to determine the rate of complications associated with childbirth in hospitals serving primarily black, Hispanic and white patients. 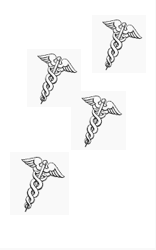 The authors found higher rates of adverse events in the black hospitals. “Twelve of 15 indicator rates were highest in black-serving hospitals,” the authors wrote, “with rates of puerperal infection, urinary tract infection, obstetric embolism, puerperal cerebrovascular disorders, blood transfusion, and in-hospital mortality being considerably higher than in either white- or Hispanic-serving hospitals.” And what did the authors propose to do about this? Why, measure more, of course! “[B]etter obstetric quality-of-care measures are needed,” they intoned. What about resource disparities, you ask? Silly you. The authors made no recommendation. This is a “quality” problem, don’t you know. A decade ago, as the evidence-free P4P fad was taking off, a few intrepid observers warned that P4P could have destructive consequences, including worsening of racial disparities. Lawrence Casalino et al. were among those who issued a clear warning early on. In the title of a 2007 paper for Health Affairs they asked, “Will pay-for-performance and quality reporting affect health care disparities?” Their answer was yes: “P4P and public reporting can have serious unintended consequences, and one of these consequences may be to increase health care disparities.” Those “unintended” consequences arrived quickly. The damage done by VBP to the providers who take care of more than their share of the sickest and the poorest is now obvious. And yet the Leapfrog Group, MedPAC and other groups and individuals who led the P4P bandwagon in the early 2000s and who flog VBP now refuse to acknowledge the damage their arrogance has caused. Some even go to the trouble of accusing their critics of stupidity or greed. In a recent article for the Harvard Business Review, posted on THCB , Leah Binder, CEO of the Leapfrog Group, and three other business representatives were willing only to concede that VBP measures “may have rough edges.” They criticized “some doctors” for daring to criticize VBP, and argued we “can’t wait for quality measures to be perfect.” And why is that? Because of the “widely acknowledged … quality-of-care issues,” said Binder et al. these outcome disparities are then used to start the circular reasoning all over again: These worse outcomes are deemed to be evidence of inferior “quality,” and, in the strange world manage care advocates live in, this calls for even more crude measurement, not more resources. What is the solution to this irrational groupthink? This is grist for a much longer essay. My short answer is that health policy researchers, and managed care proponents in particular, should mentally take the Hippocratic Oath every day. That might induce them to recognize that demanding that doctors honor the Hippocratic Oath while they themselves honor no similar principle is hypocritical. Daily recitation of the Hippocratic Oath might induce managed care zealots to recognize that demanding that doctors and patients practice evidence-based medicine while they practice evidence-free health policy is hypocritical, leads to intellectual laziness, and, most importantly, inflicts harm. This paper on the Delta hospitals is a rare example of research into the costs doctors and hospitals had to incur to participate in managed care schemes. Since the birth of the managed care movement a half-century ago, the American health policy community has shown virtually no interest in measuring the additional costs imposed upon our health care system by managed care fads. Proponents of HMOs, gate-keeping, report cards, ACOs, “medical homes,” electronic medical records, P4P, and VBP demanded that lawmakers and payers adopt these programs without the faintest idea what these fads would cost payers (taxpayers, premium payers and out-of-pocket payers) and providers. Unfortunately, even this paper on the Delta hospitals is insufficiently precise. The authors did not attempt to determine what portion of the financial losses suffered by hospitals since the enactment of the ACA can be attributed to penalties imposed by the HRRP and HVBP programs and what portion can be attributed to the extra costs hospitals incur to improve their HRRP and HVBP scores. · “[D]espite the extensive investment in developing clinical guidelines, most clinicians do not routinely integrate them into their practices.” (Dan Mendelson and Tanisha Carino, “Evidence-based medicine in the United States.,…” Health Affairs 2005; 24:133-136). Betsy DeVos wants to use “enhanced accountability” to punish those teachers who work in the inner cities. Similarly, you want to punish those physicians who care for the poor, the sick, the uneducated, and the disabled, thereby denying those patients access to medical services. Two wonderful examples of modern day Marie Antoinettes – let them eat cake! Augustine of Hippo (0354-0430) said: “In the absence of justice, what is sovereignty but organized robbery?” Eventually, we must conclude with action that the business model for healthcare should not be driven by its misdirected market-place tactics.